Kandui Villas surf resort founder arrested over altercation that occurred two years ago. Former Hawaiian resident Jordan Heuer is awaiting trial in Indonesia after a surfing altercation that happened two years ago. His family and friends claim he has been wrongfully imprisoned for a crime he didn’t commit. The former big Islander moved to the Mentawai Islands in 2000 where he owns Kandui Villas, a well-known surfing resort. In May 2015, after an accidental drop in at a popular surf spot off in the Mentawai’s, Heurer allegedly got into an altercation with another surfer who endured injuries. Jordan Heuer a 43-year-old American father of two who founded the Kandui Villas. Image: Facebook. “Jordan was attacked after an accidental drop-in at Rifles. The other surfer then threatened to cut him up with a machete, and then burn down Kandui Villas, before trying to jab Jordan with his surfboard one more time. 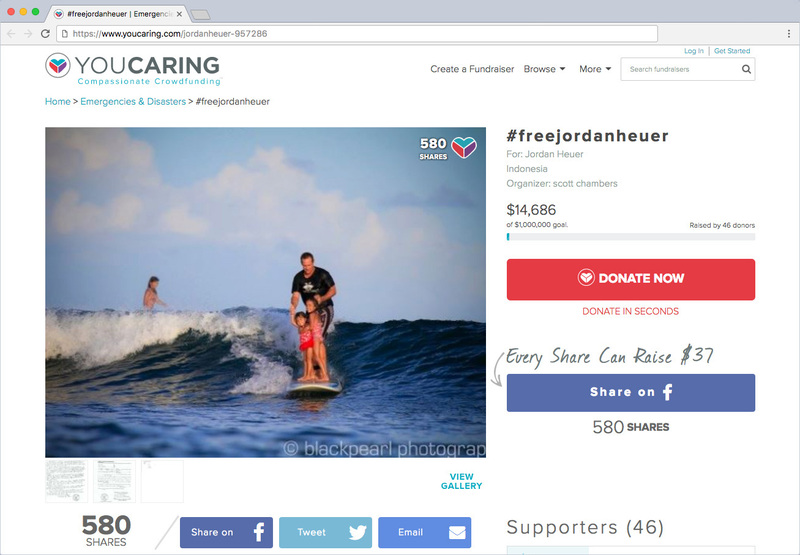 #freejordanheuer the Crowdfunding page. The funds are being raised to help with the legal fees involved in his representation and potential release fee. Many thought the case was resolved, but now the father-of-two sits behind bars, possibly facing an attempted murder charge. The crowdfunding page claims Heuer was summoned to talk with prosecutors about what happened. But when he arrived, he was taken straight to prison, with no explanation for the sudden arrest. Surfers and former guests of Jordan’s believe that ulterior motives from corrupt competitors may be behind it. They insist that there must be something more going on, for a man to be arrested over an incident that was seemingly resolved two-and-a-half years ago. Now, he will attempt to fight the charges in court. Jordan is the kind of guy who would give you the shirt off his back. “Most people have an enormous amount of respect for Jordan in the Mentawai’s. He was one of the original pioneers in the area,” Matt Grenly, surfer and life-long friend of Jordan told The Inertia. “He had never got into a fight like this before. Jordan is the kind of guy who would give you the shirt off his back. As a matter of fact, my last trip to Kandui Villas was three weeks [ago]. If found guilty as a result, Jordan Heurer could potentially be facing six years minimum in prison. So far, the crowdfunding page has raised $14,676 (about £10,885). But with the possible bail and legal bills coming to $1,000,000, they still have a long way to go.